Supports up to a 17 Inches laptop or a maximum weight of 13 lbs. 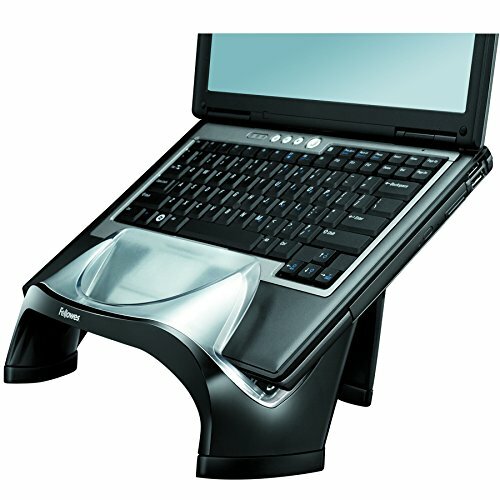 The Fellowes Smart Suites Laptop Riser with USB Hub encourages separate keyboard use to ensure correct ergonomic posture. Supports up to a 17 Inches laptop or a maximum weight of 13 lbs. Offers three height adjustments for personal comfort (6-3/8 Inches to 7-1/2 Inches). Accessory tray holds personal electronics and other items. Triangular design is vented to aid cooling, includes integrated 4 port 2.0 USB hub, and fits neatly into desk corner.